Californians will require comprehensive information about their local and regional health care delivery systems more than ever as a result of health care reform. The Office of Statewide Health Planning and Development (OSHPD) has a powerful tool for making the content of data more transparent: the highly interactive California Healthcare Atlas. 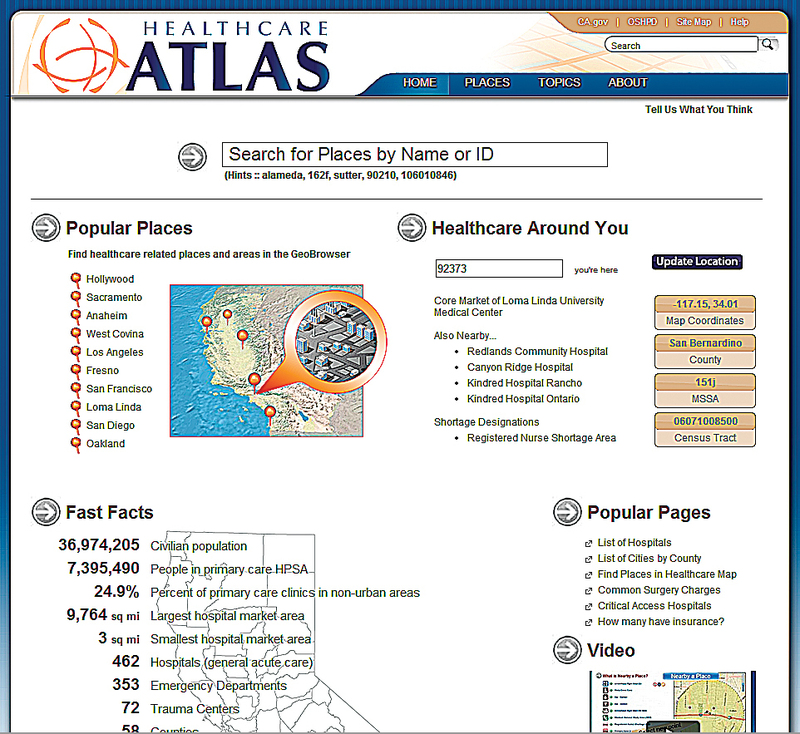 The California Healthcare Atlas is a powerful tool for making data comprehensible. The most recent version of the California Healthcare Atlas offers a variety of health care-related maps that use Esri technology. 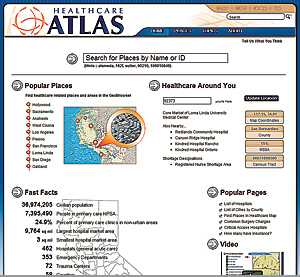 The California Healthcare Atlas website was first launched in 2005 with a relatively small set of data. The current and third iteration of the website provides access to much more data and improves information transparency, usability, and content discovery. According to Michael O'Neill, GISP, senior geospatial architect for OSHPD, "This website presents and integrates OSHPD patient, financial, facility, health professions work force, and geographic data into one easy-to-use open-data portal." The interactive Internet GIS mapping application provides users with a large and growing data warehouse and geospatial database containing detailed information on licensing, finances, and utilization of hospitals and health care facilities, as well as annual patient summary reports. The atlas serves a diverse set of users. 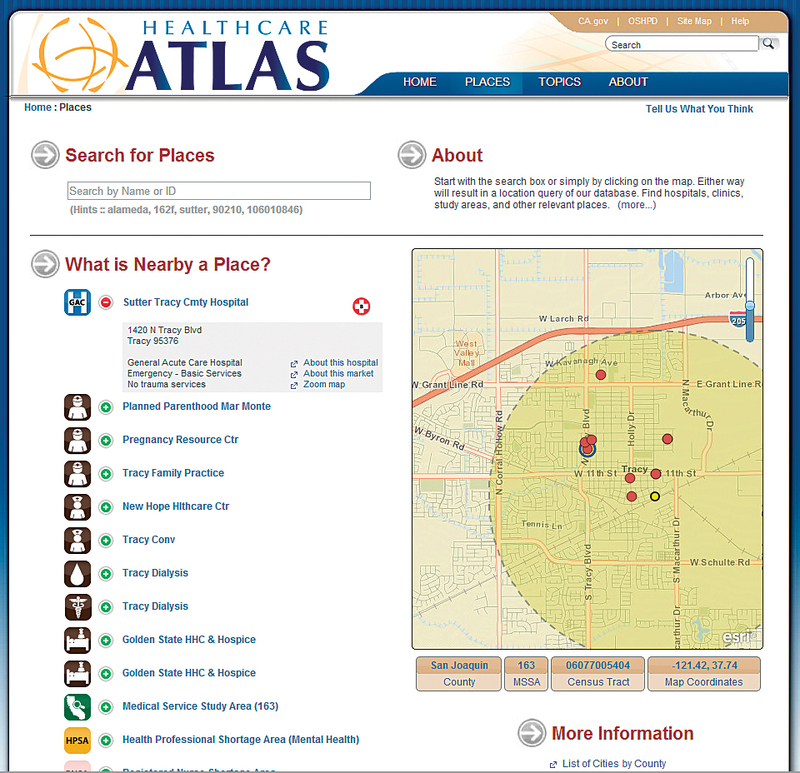 Before the first version of the atlas was released, OSHPD produced data and data products for policy makers, researchers, and facility administrators, and these continue to be OSHPD's core consumers. Previously, multiple files or systems had to be located and data synthesized to get answers, a daunting task for all but the most determined. With the altas, data compilation and cross-referencing has been done and published in OSHPD's search engine-optimized platform so that information is searchable. What might have previously taken hours now can be accessed in minutes by most people. 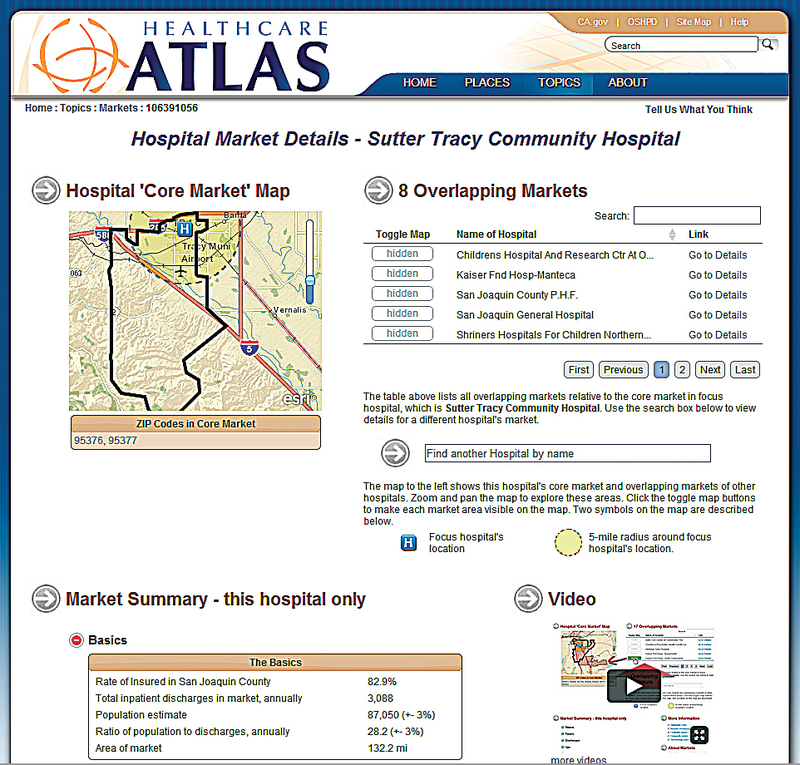 The newest version of the atlas lets users dig deeper into this information by interactively mapping financial, licensing, health professions work force, and in-patient discharge data summaries. 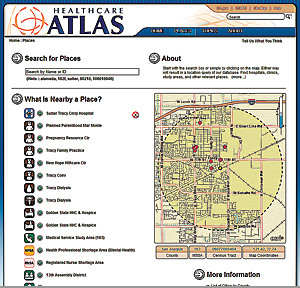 The atlas provides wide-ranging analysis capabilities through dynamic charts, graphs, and responsive maps. 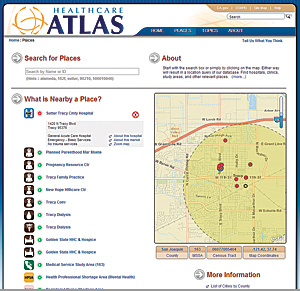 The site logically organizes and cross-references more than 16,000 geographic places with a myriad of health care facts (from numerous state and federal sources) into a cohesive, friendly, searchable, and cross-referenced atlas of health care information. For example, users can geobrowse hospitals in any part of California and discover information about any of those facilities such as special designations, number of beds, common surgery costs, service utilizations, and payer reimbursement rates. The attractive interfaces, search engines, search boxes, and especially the logical information architecture make the site's more than 16,000 pages accesssible. "But what the atlas does so elegantly is connect a wealth of once-disparate data and then make those relationships easily found and understood," said O'Neill. "This makes current data users happier, and new data consumers feel well-served." The trick to opening data, which many miss, he said, is putting out lots of data in accessible ways for the variety of users and in appropriate contexts. 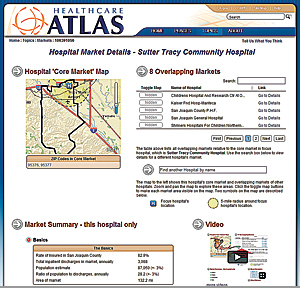 As health care reform continues to unfold, hospital market content available from the atlas is proving valuable for growth planning. The in-patient-based market maps are "critical for evaluating our growth strategies and have enabled us to have more informed conversations with potential affiliate and partner organizations," said Alfio Levy, senior associate at Alameda Health System (AHS). "The tool has been very thoughtfully developed; it saves us money and time," said Levy. AHS marketing, communications, and strategy teams are frequent users. Other site visitors seek information on areas that have one or more of the seven work force shortage designations administered by OSHPD. For example, the Health Professions Education Foundation (HPEF) is awarding $32 million this fiscal year as financial incentives to attract or retain health care professionals in areas of unmet need. 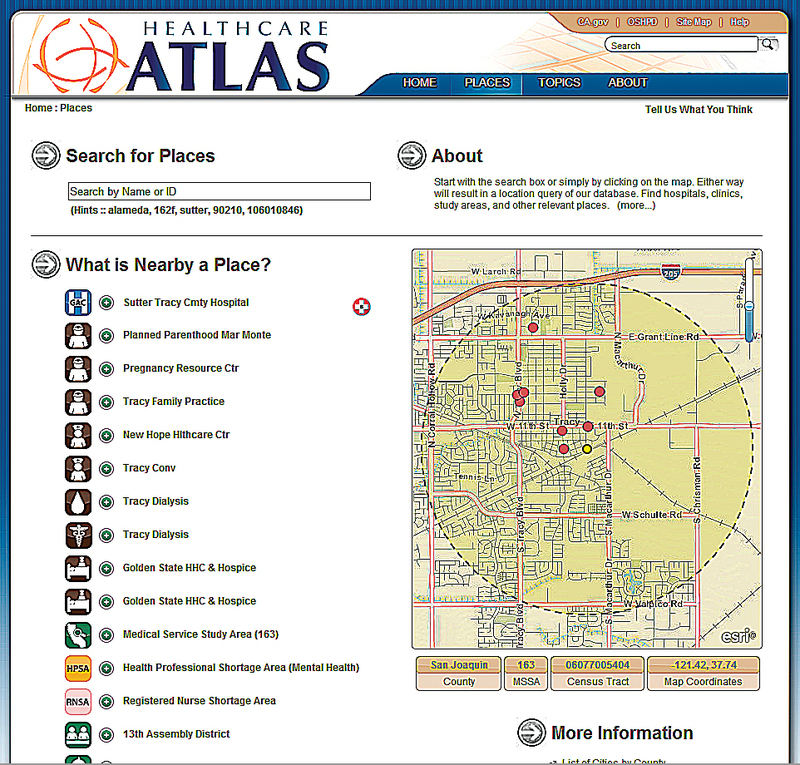 Using the atlas, individuals can quickly and easily locate where these special designations exist and learn about hospitals and clinics located in these areas. "The workload burden on staff, grant applicants, and awardees was, in the past, unnecessarily cumbersome," said Charlene Almazan, lead program officer for HPEF. The website makes their work so much easier and quicker. "I love telling our grant applicants and awardees to use my GIS," said Almazan (who is not a GIS staff member). According to Arsenio Mataka, assistant secretary at California Environmental Protection Agency, "having the geographic and demographic information about which areas in California lack sufficient health care professionals provides executives and other decision makers with meaningful insights as they move to improve the health and economic vitality of our state's most impacted communities." "It's such a simple thing—connecting the geographic dots—and yet the simplicity belies an essential step in connecting people needing services with enough health professionals to provide those services," O'Neill said. The site uses geography to make a wealth of data about the health care landscape discoverable. Health care in California is a complex landscape of practitioners, hospitals, clinics, patients, businesses, insurance, diagnosis, treatments, research, and more. In practice, the data reflects that landscape's complexity. Using, managing, and planning health care is neither simple nor easy for anyone. High on any list of challenges has to be information access and transparency. In many ways, OSHPD faced an "open data" challenge 12 years ago. There were virtual mountains of ethereal bits and bytes stacking up within the walls at OSHPD. The challenge back then—and today—has been to harness the many unwieldy data silos so that they churn raw data into information in a tangible, inviting way, he said. There was too much data, period. That data was too complex and nuanced. Too few staff had sufficient GIS knowledge and skills. There were many data silos. It was too difficult to find data. It was also too difficult to combine disparate datasets. Publication media was too limited. Having recognized the value of GIS and openly acknowledging these issues, management moved on multiple fronts to deal with challenges such as insufficient funding and resources. A feasibility study report was produced to make the case for funding a new enterprise-level GIS program and a large, complex data warehouse. That lengthy endeavor began in 2000. By 2004, programs were funded, contracts were executed, and OSHPD had the beginnings of a fledgling enterprise GIS and data warehouse. "That big step was difficult and yet essential to having the atlas today," O'Neill said. "Thanks to what management began in 2000, a foundation of information technology and organizational infrastructure was laid that ultimately made possible all that the atlas has become." According to O'Neill, Esri has been a vital technology and solutions partner from the start. The first incarnation of the website published a smaller range of data and debuted as OSHPD's initial public offering of online mapping combined with data from the new patient data warehouse. The site featured a cutting-edge web query system—California's first-ever interactive mapping of health care data that provided access to financials, licensing, facilities, and in-patient discharge summaries. More new data types, new functionality, new workflows, and new technology were subsequently added. Users can geobrowse hospitals in any part of California and discover information about any of those facilities. "We blend in a variety of small and large technology products, but we are an Esri shop for our geospatial solutions. We consume all the major Esri products ranging from the desktop ArcGIS software to ArcGIS for Server for mapping and geodatabase management. Having that consistent and complete set of GIS offerings from the industry leader has been valuable." The OSHPD GIS team authors and maintains its geographic datasets for the atlas with the same software used for regular cartographic production, which allows publishing map services easily on ArcGIS for Server. From a staffing and resource perspective, O'Neill and colleagues find this setup ideal because it allows them to efficiently pair tasks with available staff skills. GIS tasks are assigned to GIS professionals, and website development is accomplished by programmers. "Managing the geographic datasets is actually a huge and complex undertaking made easier with Esri tools," said O'Neill. Some of the secret sauce found in the atlas flows from a cookbook-like library of over 100 custom ModelBuilder models that encapsulate approximately 1,800 processing steps. "Without that essential automation using the Esri tools, we could not ever keep up with the data maintenance," he said. Having several years of experience and user feedback under its belt, OSHPD realized that things had to change in order to keep up with quickly evolving expectations for the user experience. The new third-generation version of the California Healthcare Atlas modernizes the platform on which it runs, improves usability, increases data transparency, and adds new data. "The site's layout is reorganized to better hold the huge and diverse content presented now and to allow for adding new content going forward," O'Neill said. "Everything relates to something and—oft-times—to many things at once. This reflects reality and real geography where hospitals, people, and administrative boundaries are interconnected." The threads or pathways through the site's more than 16,000 pages are seemingly limitless. It's a formidable mountain of data made tangible by attractive interfaces, search engines, search boxes, logical information architecture, and gobs of cross-referencing. "This generation of the website marks a new beginning for information transparency, site usability, and content discovery offerings by OSHPD," he said. California is the only state in the nation to host such a collection of geographic and health care data that is fully searchable, cross-referenced, indexed, discoverable, and yet still user-friendly. Much of what this latest version was about revolved around resetting the foundation to support new capabilities and to create room for adding new content. Plans for the next few years include the addition of new health care quality measures and expansion of the hospital market content, as well as the creation of more ways for people and systems to consume the data. "We've not perfected the atlas by any means. That would take resources we simply don't have today," said O'Neill. "But what we have done so far is to open data silos—wrapped in an inviting package—thus allowing many more would-be information consumers access to authoritative content. We will continue to improve upon our report-like managed content and also improve upon freeing the data in new ways to put the power of information into peoples' hands," he said. "We have been wrestling with how to connect more people to our data for years and think we've had a breakthrough with this latest version of our atlas product. Nobody has a platform like this."